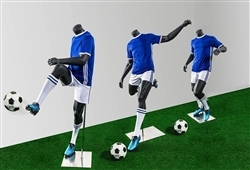 This matte white young boy basketball mannequin is athletic and sporty. He is made of fiberglass and with his hands on his hips. Perfect for displaying youth basketball apparel and custom team uniforms. He has detachable arms, hands and leg for easy dressing. Includes base and calf support.